Home | Serigraphs and Giclee Fine Art | Lorna Patrick | Lorna Patrick Limited Edition Serigraph on Paper:"Diamonds"
Lorna Patrick Limited Edition Serigraph on Paper:"Diamonds"
About the Art: Lorna Patrick's creative drive, imagination and technical virtuosity have forget a unique style of work that began at a young age. As an aspiring painter, she was captured in her kindergarten photograph standing at an artist's easel. In grammar school, Patrick was commissioned by parents for portraits of her classmates. 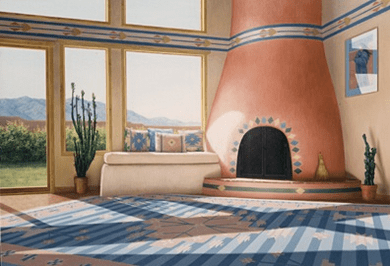 While still a teenager, the artist had refined her talent so impressively that Patrick's mother exhibited the artist's oil paintings in her Palm Desert, California gallery. Patrick's relocation to New Mexico at twenty-one marks an important turning point in the life of the artist. While teaching at the Albuquerque Institute of Art, Patrick felt what she describes as "the enveloping spiritual energy of sunlight." She began to understand and to interpret the profound relationship between the people and their environment. A deep, spiritual and philosophical belief in man's harmony with nature emerged as a result of these experiences and has become the basis and subject of Patrick's art. Patrick's superb technique and affecting images gained distinction among art collectors in New Mexico and throughout the Southwest. Having worked primarily as a commissioned artist, Patrick's original paintings have also adorned the walls of Santa Fe galleries. For several years Patrick exhibited at the prestigious Jamison Galleries. She has also shown her work at the Marcus Gallery. When Patrick entered the annual competition at the New Mexico State Fair, she won First Prize in the category of oil painting, as well as the highly acclaimed Most Popular Painting award. Home | Fine Art Prints & Limited Editions | Gallery Direct Art is your Authorized Chalk & Vermilion Dealer | Lorna Patrick | Lorna Patrick Limited Edition Serigraph on Paper:"Diamonds"